I was in Coney Island and passed by a Halal Truck parked along Stillwell Avenue under the subway station. We were looking for some food and the scents emanating from the truck smelled so good that this truck was the chosen food source for the night. I choose the lamb with rice. This consisted of a mound of yellow rice topped with lots and lots of gyro meat. A salad was served on the side. Everything was then topped with white sauce and a little of their hot sauce. I did enjoy this meal (way better than Nathan's less than a block away in my opinion). The meat was flavored very nicely. The rice was cooked well, and the sauces were tasty. It also ended up being a huge portion of food for a very affordable price. While in NY, I was looking for a late breakfast and ended up at the Chelsea Market. I had been here before and tried The Lobster Place. On this visit, I quickly forgot breakfast foods and decided to try an Australian meat pie from a place called The Tuck Shop. I made my way up to New York. 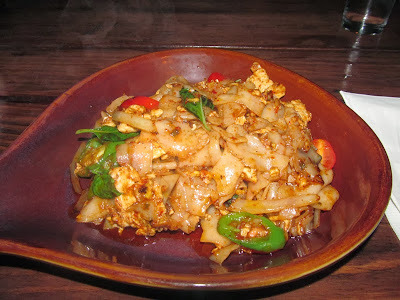 One of my meals in the city was Thai food in the Lower East Side at a restaurant called One More Thai. During my travels along the east coast (which appear to be an extended adventure on this blog but actually happened during two trips which added up to just over a week), I had dinner one evening in New Jersey at the Menlo Park Diner. Menlo Park's big claim to fame was that they were once home to Thomas Edison's laboratory. I paid the site a visit, but unfortunately they were closed for renovations. That meant food was the big attraction here. I ordered the spinach and feta omelet. This was served with homefries and toast. There was plenty of feta in here, making the omelet filled with lots of salty, cheesy goodness. The homefries were alright, although a bit bland. The rye toast came pre-buttered. Overall, pretty typical of a diner breakfast. We dined here with someone named Jeffrey Wiernik. Jeff has ambitions of being a world famous food blogger. 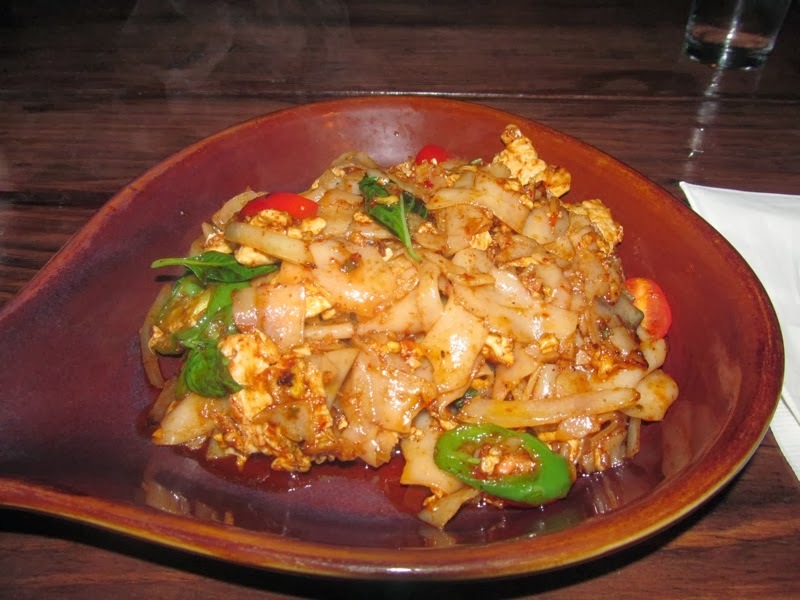 People normally aren't featured on this blog, but Mr. Wiernik asked to be published as he begins his food blogging adventure. He ate chocolate chip pancakes at the diner. This is what he thought of them: The pancakes were light & fluffy. There was an even amount of chocolate chips throughout each of the pancakes. Follow Jeff on Twitter at @JeffreyWiernik and read his blog (that has yet to contain any posts about food) for more insightful thoughts potentially about food. 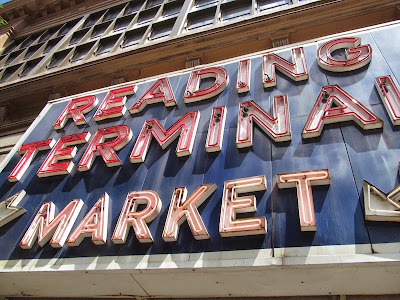 While wandering around Philadelphia, I stumbled across the Reading Terminal Market. I had heard of this market in the past, but completely forgot about it until it was in my sights and bells went off in my brain that I should go in. 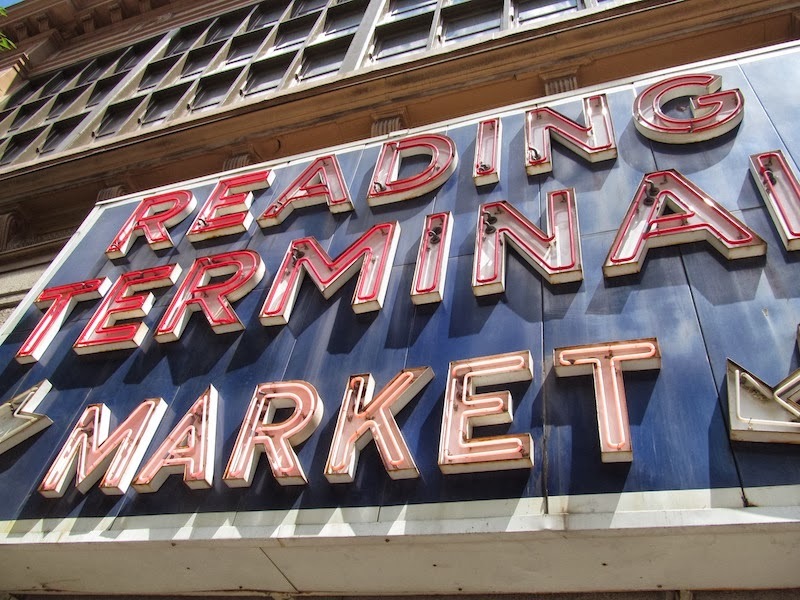 Inside, Reading Terminal Market sort of reminded me of Chelsea Market in New York, only on a larger scale. They sold almost every type of food stuff imaginable in here, ranging from Pennsylvania Dutch made cheese to Middle Eastern foods to Italian pastries. The whole market was swarming with people, some taking foods to go, although the majority seemed to be eating in the tables set up in the aisles between the various vendors. I had already ate lunch at Tony Luke's earlier in the day, so I decided I would get some dessert in the market. I came across a place called Termini Bros that caught my attention. They had giant butterfly cookies in their display case. I have some happy food memories from when I was a little kid associated with these cookies, so I decided that I would get myself one. The cookie was huge, probably a foot long from wing tip to wing tip. It was made of a flaky dough with a sweet cinnamon filling between the layers. I totally overdid it, but I devoured the entire cookie in one sitting. We also got a cannoli from Termini Bros. They were filling these behind the counter as ordered, so it definitely made it more interesting than just getting a pre-made dessert from the case. The filling had a very strong ricotta flavor which I enjoyed. To me, this is what cannoli filling should taste like. The person who I split the cannoli with disagreed and prefers the typical Florida Italian restaurant cannonli filling which tastes more like icing. While in Philadelphia, I decided I had to eat what is perhaps the city's most well known food: The Philadelphia Cheesesteak. I googled cheesesteaks in the city and a restaurant called Tony Luke's came up on the upper portions of the lists of the best cheesesteaks in the city. The restaurant wasn't too far from where I was, so it was the lucky cheesesteak winner. Tony Luke's was located in an industrial area. You ordered your food at a window and dined in their outdoor seating. There was a very varied crowd here, ranging from very obvious tourists like me, lots of airport workers, and construction workers. While I was waiting for my sandwich, I headed over to their pepper bar and sampled a couple of these hot pickled peppers. For my sandwich, I had a Philly Cheesesteak Hoagie. This consisted of steak, provolone cheese, lettuce, tomato, and mayo. I wasn't really sure if I'd be able to tell the difference between a cheesesteak in Philadelphia compared to the sandwiches in Florida. Turns out the biggest difference I noticed was in the steak itself. Rather than the really finely sliced beef that I've had elsewhere, the steak from Tony Luke's was a bit thicker. I would estimate the slices were about double the thickness of standard cheesesteak meat. It also had a meatier flavor, so perhaps less seasoning/processing was used to prepare the steak. Overall, this was a tasty sandwich. I can also now say that I've eaten a Philly cheesesteak in Philadelphia. That makes me a self-proclaimed expert on this type of sandwich, right?